WHY I AM SHARING THIS MUSIC ON MARTIN LUTHER KING DAY? Because this of all days is the closest thing we have to a national reflection about race and how to dissuade ourselves of it’s illusion. This song is violent, damaged and filled with fear, my portrait of American racism. I wrote and recorded this music in Michigan during a 2012 Hill House composer residency for ISLAND (Institute for Sustainable Living Art & Natural Design). I prefer to say little about this song and just let it speak for itself. 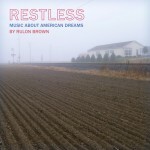 You can find it on my new solo album, RESTLESS – music about American Dreams. If you want to be notified when I post new tunes, please Subscribe, like, follow, or google+.